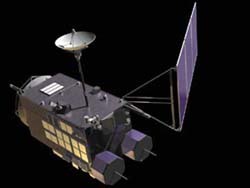 SELENE (Selenological and Engineering Explorer) is a Japanese mission to study the origin and evolution of the Moon, and help develop the techniques needed for future lunar exploration and utilization. Following the many trips to the Moon in the 1960s and 1970s, our nearest celestial companion in space fell out of space-exploration favor. Russia's Luna 24 was the last lunar lander, a quarter of a century ago. SELENE gave scientists and engineers around the world a new and better assessment of the potential for future human utilization, and even habitation, of the Moon. After a four-year delay, SELENE was finally launched on September 14, 2007. As is traditional with Japanese spacecraft, the three-tonne probe was given an alternative, Japanese name, Kaguya, after a mythical princess story who ascended to the Moon. SELENE orbited Earth before traveling the 380,000 kilometers (237,500 miles) to the Moon. There the main orbiter and two smaller sub-satellites were be positioned 100 kilometers (60 miles) above the lunar surface.